In patch 8.1.5, we’ll be getting a brand new Timewalking event, this time catching us up to the Warlords of Draenor expansion. Timewalking events can be fun for nostalgia, but the real draw is the loot from the weekly quest, and the mounts you can acquire. Each Timewalking event includes a thematic mount. Burning Crusade and Wrath of the Lich King each have a vendor mount for 5000 badges, and Cataclysm’s mount is a random drop from any Cataclysm Timewalking dungeon boss. Naturally, Warlords Timewalking will have a mount reward as well. However, unlike the previous expansions’ Timewalking events, this one comes with not one but two new Timewalking mounts. And they are literally on fire. Beastlord’s Irontusk, an elekk with smoldering tusks, and Beastlord’s Warwolf, an armored wolf with a fiery forge, will be available for 5000 badges each from the Warlords Timewalking vendors. 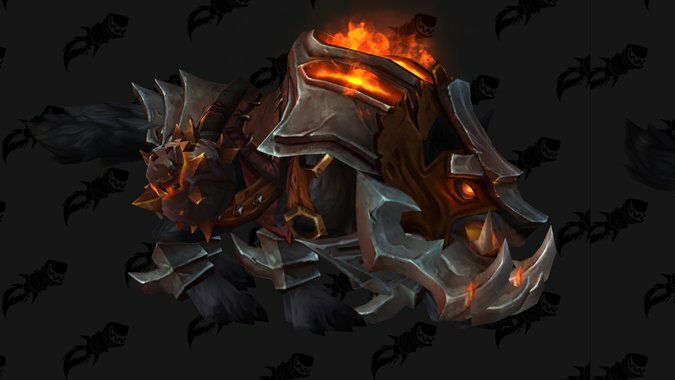 Keeping with the theme of the expansion, the two mounts resemble and are named after Beastlord Darmac’s companions in Blackrock Foundry. Like the other Timewalking events, Warlords Timewalking has its own unique vendors and rewards. The vendors’ full stock isn’t revealed (a couple pieces from the Chromie set are there), but we can make an educated guess as to what will be included. If it follows the other expansions’ Timewalking vendors, Warlords will include scaled gear from that expansion and reputation tokens for Warlords reps for purchase with Timewarped Badges, as well as heirloom upgrades. The Warlords Timewalking vendors will be located in each faction’s base outside of Ashran. For the Alliance, Tempra will be in Stormshield, and for the Horde, Kronnus will be in Warspear. We don’t have a patch date or even an estimate yet, but we wouldn’t be guaranteed to see Warlords Timewalking happen right away either. Since Timewalking events go in chronological order, Warlords Timewalking will be added to the end of the lineup. On the PTR, the first Warlords Timewalking event is scheduled for the week of May 28 to June 4.